Spring hasn’t sprung yet in Maine. Off-season sailing means that all the best moorings and anchorages are free for the taking and the islands are crowd-less, ready to roam! 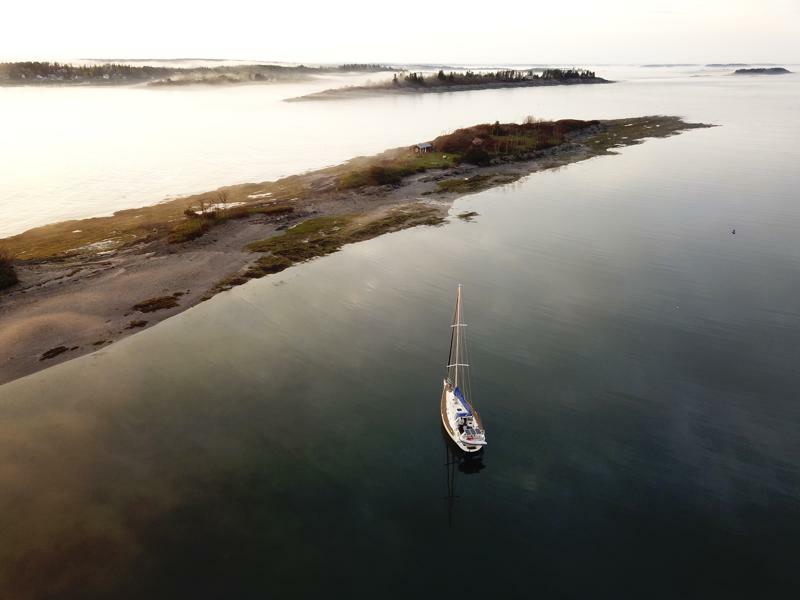 * Photo credit – Detour sailing toward Portland (above). Thanks, Dan! 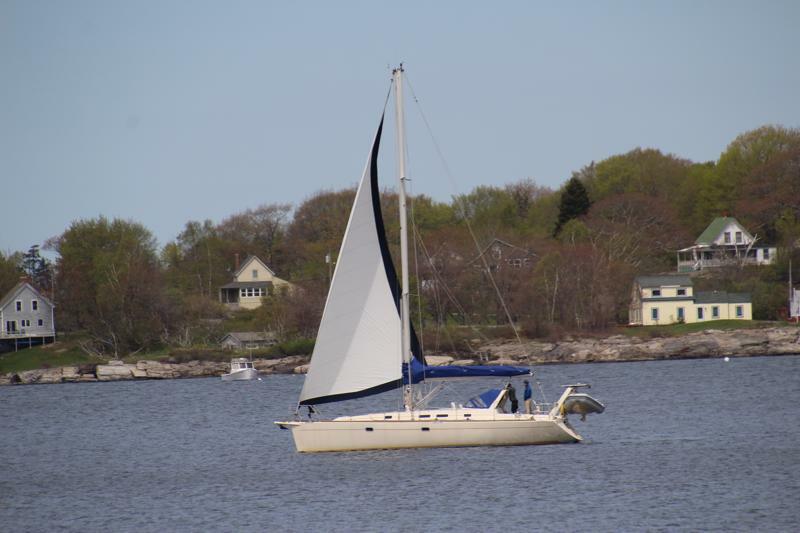 We had a fabulous sail from the Isles of Shoals, with a light southerly breeze behind us, to our first stop in Casco Bay at Cocktail Cove, Jewell Island. What I remember of Jewell Island, from our previous visit 5-years ago aboard Rode Trip, are the mosquitoes. As soon as we’d stepped foot on the island mosquitoes swarmed toward us by the hundred thousands, each seeking a savory blood draw. 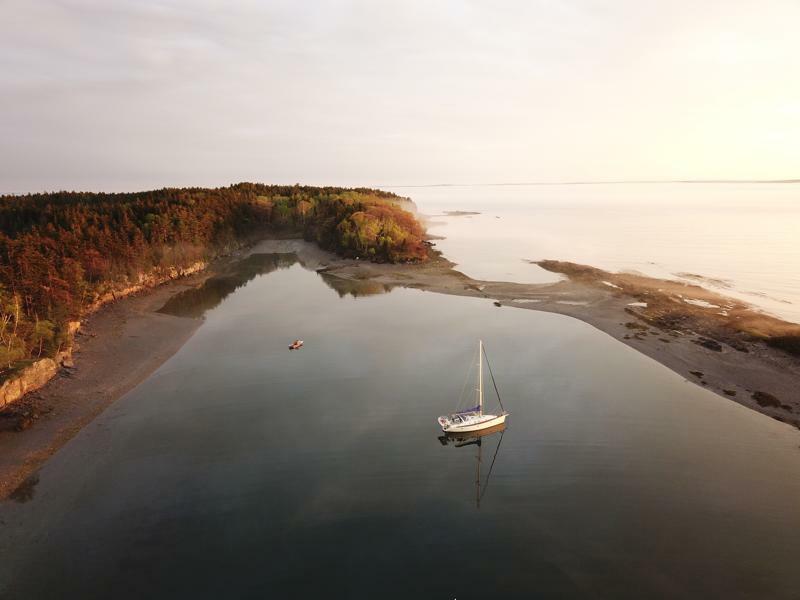 Jewell Island is uninhabited and has several, short trails and several campsites which are maintained by a collaboration of Maine Bureau of Parks and Lands and the Maine Island Trail Association. I remember practically sprinting halfway along one trail, finding refuge inside the World War II military installment and then actually sprinting back toward the cove, diving into my kayak, and shoving off toward Rode Trip to be rid of the blood thirsty buggers while declaring, “This island is AWFUL!” Much to the dismay of my husband, who at that time was a newfound captain aboard his own boat, the beauty of Jewell Island was lost on me. During May, it’s too darn cold for mosquitoes, so Jewell Island becomes a lovely place! Brian and I waked all the trails, leisurely, this time. Looks lovely, wish I were there. Hi Steffi & Heike, HAPPY to share with you 🙂 Hugs from us! Hi Paula, could have easily gotten you to shore here! Visit anytime!